Dawn of the Planet of the Apes (2014) is a vibrant, moving, beautifully-dramatized series entry that very much concerns the same reckoning. 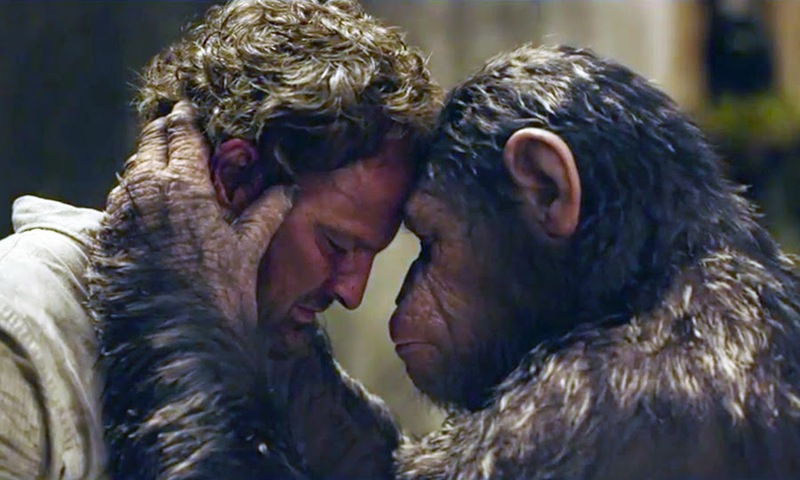 The film revolves around Caesar’s (Andy Serkis) fall from grace or innocence, and the lesson that apes are not superior to man merely because of their nature. The world is not always a case of us vs. them, good vs. bad. Caesar learns this in the film, though with great difficulty. 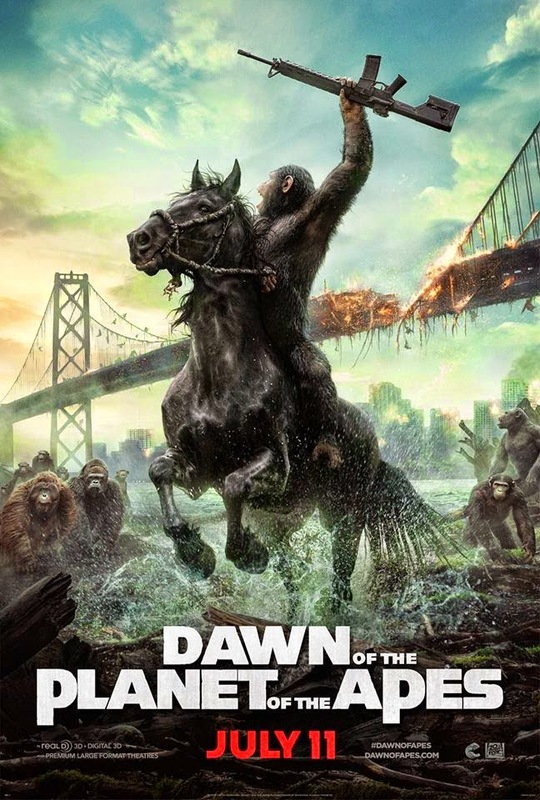 In addition to being a rock-solid remake of (and improvement over…) Battle for the Planet of the Apes, the new film -- in the best tradition of the long-lived franchise -- features a powerful subtext and social critique. In this case, much of the new film revolves around the very quality that is damaging our nation so grievously today: tribalism. And in gazing at the pitfalls of tribalism, Dawn of the Planet of the Apes asks explicitly (in its very dialogue) about something else. It asks about strength, and what that word truly means. Does strength stem from superior numbers? From family? From racial unity? From the barrel of a gun? Does strength come from an irrational refusal to compromise with those who don’t see the world precisely as you do? When faced with facts that disprove your world-view, do you double-down anyway, in hopes of being seen as "resolute?" Or do you adjust to facts and go a different way? Instead of these answers, Dawn of the Planet of the Apes suggests another definition of strength. Strength can, perhaps, emerge from an understanding that your tribe has made a mistake. Strength, in some cases, is all about having the guts to do something about an injustice you have played a role in creating. In terms of the film, this is the chaotic terrain that Caesar must navigate, and there are no easy answers, and no guarantees that his answers are the right ones, either. The humans and apes by-and-large double down on hatred and distrust, and the film's climax reveals exactly where that kind of thinking leads. This is not an empty lesson in America of today, where we have become divided by labels like liberal and conservative that, in the final analysis, don't even adequately describe our beliefs. A serious-minded, carefully-structured morality play, Dawn of the Planet of the Apes also daringly eschews all the bells-and-whistles we have come to expect from modern summer blockbusters. For instance, there are no action scenes in the film that exist just to wow us or bowl us over. 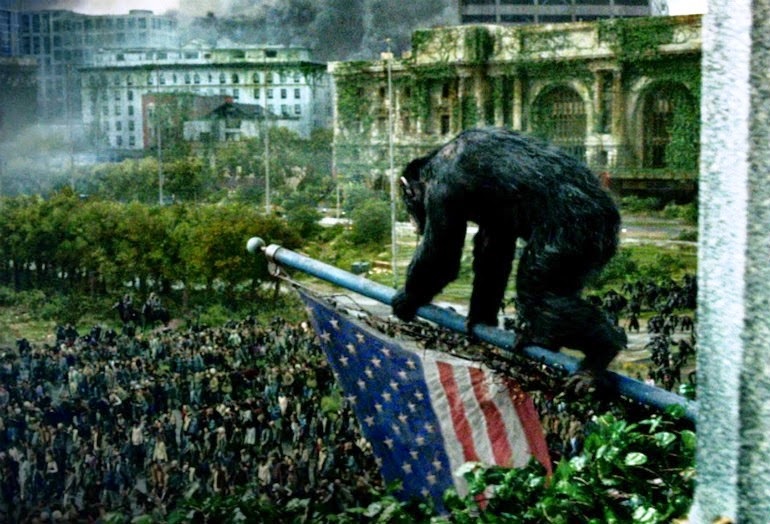 Furthermore, there is no gimmicky “surprise” final shot in Dawn of the Planet of the Apes that attempts to up-stage the famous Statue of Liberty ending of the 1968 original. The film ends as it begins, with extreme close-ups of a leader’s intelligent eyes as he carries the weight of his people, and the future, on his shoulders. These book-end images place emphasis exactly where it should be: on Caesar’s learning curve as a rational leader, family man (or ape), and guardian of moral values in an uncertain world. 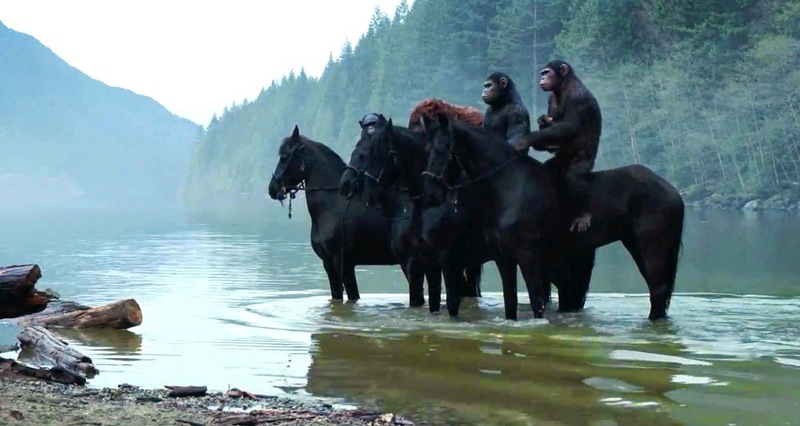 Most delightfully, there is no fan service to speak of in Dawn of the Planet of the Apes, no moments that make us reckon with the existence of a larger franchise, or franchise history. Not a soul jokingly quotes famous Charlton Heston dialogue or plays with Statue of Liberty toys. 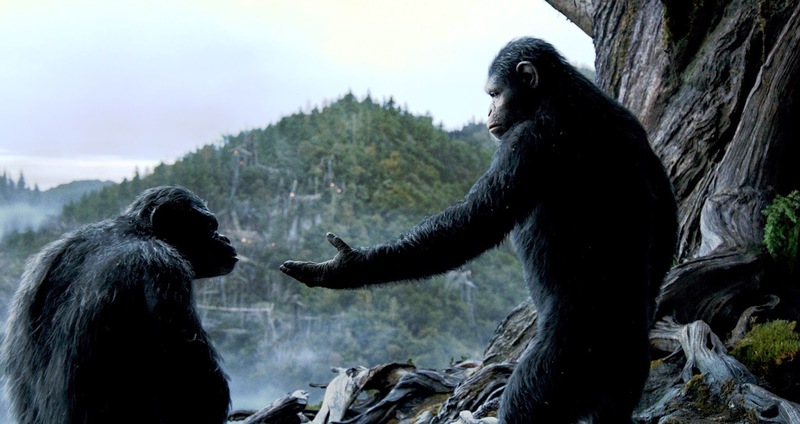 Instead, director Matt Reeves lands us smack-dab in the planet of the apes, and tells us a great, involving, heart-wrenching story while we are there. In the process, he’s given audiences the best Apes movie in a generation. Ten years after the Simian Flu wipes out most of humanity, Caesar (Serkis) leads a society of intelligent apes in the safety and beauty of Muir Woods. A father to a new-born son and a teen, Blue Eyes, Caesar and his friends, including Koba, Rocket and Maurice, have established new laws to guide the primates, including the edict that ape shall not kill ape. One day, in the woods, Blue Eyes and another ape, Ash, encounter a human, Carver. 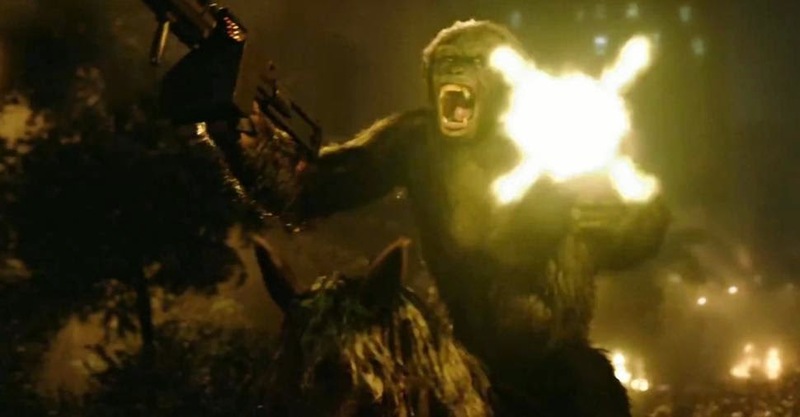 The human immediately draws a gun and shoots Ash, though the ape survives. 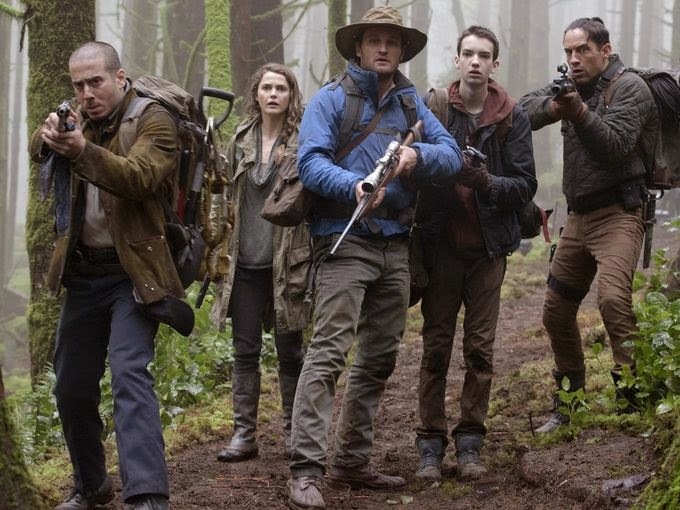 Caesar orders Carver and his human cohorts, including Malcolm (Jason Clarke), Ellie (Keri Russell) and Malcolm’s boy, Alexander (Kodi Smit-McPhee) to return to their home, and never to return to the forest, the realm of the apes. But the incident has already set in motion a series of events that can’t be undone. Distrustful of humans, Koba begins to form an insurrection against Caesar, recruiting even the leader’s own son, Blue Eyes. And back in San Francisco, the leader of the human colony, Dreyfus (Gary Oldman) prepares for war with the apes. His people need to generate electricity using a dam in ape territory, and rather than see humanity fall back into the Dark Ages, Dreyfus is willing to kill to keep the lights on. Malcolm and Caesar work together to help the human city maintain its power, but dark forces on both sides of the tribal divide plot to break the fragile peace. Firstly, there can be no doubt that Dawn of the Planet of the Apes is a remake of Battle for the Planet of the Apes (1973). Events and some specific characters are different, it is true, but in terms of spirit and intent, the two films boast many connections. Both films, for example, reveal Caesar’s Ape civilization at an early stage of existence in the middle of a picturesque forest. Similarly, both Battle and Dawn involve the march of the generations. In both films, we see that Caesar is a husband and a father. In Battle, his son is murdered by an insurrectionist, Aldo, and that is nearly the case, as well, in Dawn. Uniquely, the son of Caesar character is also visually associated with guns in both pictures. In Battle, we see young Cornelius playing a childhood game with a stick. He pretends it is a gun, and make-believe “shoots” a human opponent. In Dawn, Caesar’s boy, Blue Eyes, picks up a real gun, and goes to war, though ultimately he regrets his actions. Significantly, both films also find Caesar returning to the ruins of an old (human) city and unearthing there the wisdom of his father. 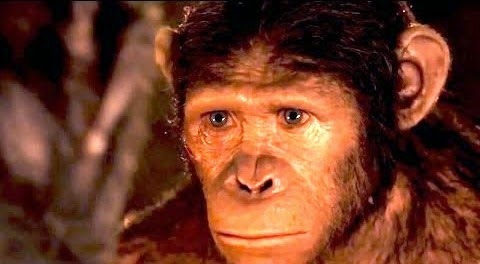 In Battle for the Planet of the Apes, Caesar sees film-reel footage of Cornelius, who warns him that the world will end in bloodshed if the militarism and anti-human beliefs of ape culture are not put down. 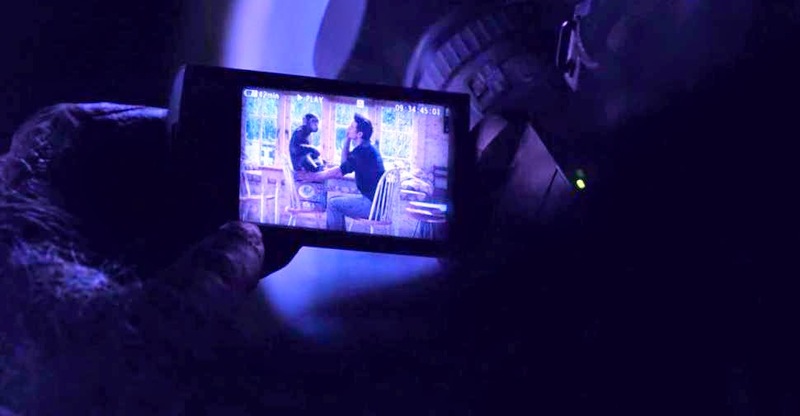 In Dawn of the Planet of the Apes, Caesar returns to the San Francisco home we saw in the previous film, Rise of the Planet of the Apes (2011) and watches recorded images from his own childhood. He sees that Will Rodman (James Franco) loved him…and gave him a home. This footage reminds him of a fact he once knew: not all humans are bad. In both cases, the (dead) father provides the wisdom that Caesar needs to help him choose sides, and avoid unnecessary blood-shed. 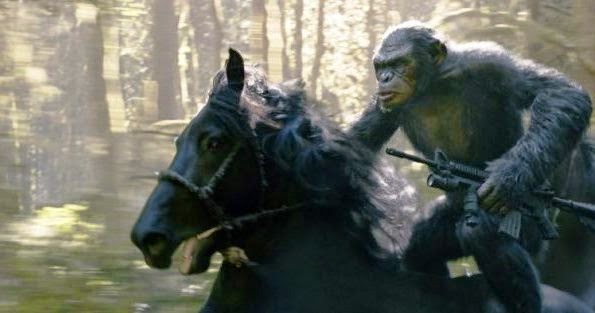 Many of the story beats in Dawn of the Planet of the Apes also follow those featured in Battle. For example, in both stories there is an inter-species war (ape vs. man) that “good” apes (like Caesar, Virgil, and Maurice and Rocket) don’t wish to undertake. Apes and humans fight, but the war is expressly against the will of this group, who argue instead for peace. Secondly, both films also feature an insurrection in the fragile, protean ape culture, led by a war-like ape that steals machine guns from an armory. In Battle, that ape was a gorilla, Aldo. In Dawn, it’s Koba. In Battle, Aldo steals from the Ape armory, which is guarded by Caesar’s "conscience," a kindly old ape named Mandemus (Lew Ayres). In Dawn, Koba robs from the humans and takes their guns. In terms of specific set pieces and theme, both films also end with a literal fall, one visually representing a fall from innocence. Aldo falls to his death from a high tree branch in Battle, after combating Caesar. Koba falls to his death from a high skyscraper scaffold after combating Caesar in Dawn. The setting has changed subtly in the battle, but the nature of the setting -- the highest branch that apes always seek out, so-to-speak -- and the conclusion (a fall from grace…) serve as the metaphorical and physical climax of both Ape pictures. The fall from grace plays out in another way too. In both films, Caesar is forced to kill an ape that he trusted, in direct contravention of the law that ape shall not kill ape. Yet he does so, ironically, to assure the continuance of ape culture and ape law. Thus his people -- in both films -- must reckon with a complicated nuance or shade of gray. The law must sometimes be bent or broken to save it for future generations. Values must periodically be hauled out and re-examined. In this case -- and only sometimes -- to save civilization, an ape must kill an ape, alas. The notion of tribalism overwhelming reason is a consistent leitmotif in the film. For example, Dreyfus (Gary Oldman) and his human cohorts risk everything for...electricity. They have decided, at some point, that electricity equates to civilization in their eyes, and they are not willing to step-down from that belief. The humans could use torches or fires to light the night-time of San Francisco, but instead they cling to a delusion. They want things exactly the way they used to be....even though the Old World is now completely dead. They thus cling to a convention or tradition not because it makes sense in the present, but because it made sense in the past. They can't adjust to the present, and rather than do so, will kill to preserve a tradition that they cherish. The same humans then double-down over this need for electricity. When faced with a challenge in acquiring it, they don't re-examine their beliefs. Instead, they decide it is valid to start a war and take it by force, killing many innocents on both sides in the process. Similarly, humans like Carver blame the apes for Simian Flu, successfully marginalizing them as enemies of humanity when that isn't precisely the case. When Carver is pointed to the facts by Ellie: that the apes were experimented on by humans, and that humans created the Simian Flu, Carver -- like others -- doubles-down on his ignorance and refuses to acknowledge the unpleasant truth. Importantly, Koba also doubles-down on hatred and false beliefs. Even though situations have changed dramatically in ten years, he can see humans only as the monsters who tortured and abused him. He is now free of that captivity and safe, and human civilization has fallen to ruin, but he doesn't let such facts interfere with his consuming hatred for an "enemy." In reckoning with such notions, Dawn operates on a plateau of moral and storytelling complexity well beyond its impressive predecessor. 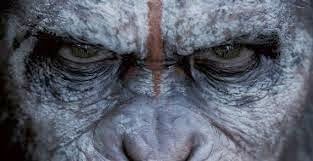 In Rise, it is easy for Caesar and his ape army to hate humans, for they have come to know humans only as sadistic and cruel. Caesar’s learning curve is much more difficult in Dawn, as he deals with the fact that it is an ape, not a human, who endangers the future of ape society. Life is rarely so simple as tribalism makes it out to be. There are villains and heroes among "us" and among "them." If Rise is about Caesar taking control of his life, Dawn is about Caesar realizing that life is far more complex than he had understood. But he is ultimately a strong leader (and a great character) because he takes responsibility for his actions and mistakes, specifically for trusting Koba instead of realizing that apes too can "double down" on violent tendencies and beliefs. 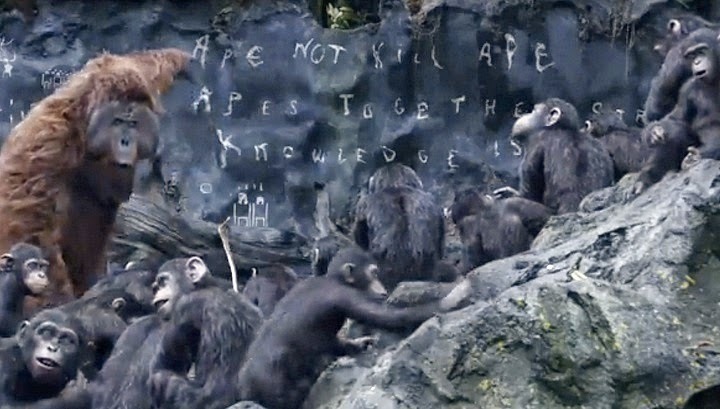 Dawn of the Planet of the Apes examines the tribal mind-set well, without ever seeming preachy. Koba gains adherents by suggesting, explicitly, that Caesar loves humans more than he loves apes. This is not even close to being a true statement, and yet when apes see Caesar cooperating with humans, Koba’s words gain a certain level of surface legitimacy. In point of fact, Caesar is merely attempting to prevent bloodshed, because he knows how it will ultimately end: with many deaths among “us” and “them.” But to some apes, he has become weak. Why give aid and comfort to the enemy? On the flip-side, why not help someone who could one day be a trusted friend? Ultimately, we see that it is Koba who is the weaker individual, because he cannot look past his own grievances and stereotyped views of humans to see that the men around him --Malcolm, Ellie and Alexander -- want only what the apes want: to survive. Instead, he looks at them as being part of a tribe that he hates, and so writes them off without a second look. Again, the message is one worth repeating. Liberal or conservative, Christian or atheist, straight or gay, black or white, male or female, ape or man, we all love our children and all want to live happy lives in freedom. Why do we have to demonize each other when we have in common such important traits? One nice aspect of the film is that Dawn of the Planet of the Apes treats human beings and apes as, essentially, mirror images, and no one side emerges as more villainous, thus making a point about tribalism that transcends partisan politics. Dreyfus cannot see the apes as anything more than mere animals, and so, like Koba, bases his decisions on faulty, out-dated information. In some way, then, the film suggests that the worst tribal instincts occur when we believe things of other people that perhaps once were true, but may no longer be so. We must examine such "truth" for ourselves, and see if it holds up. We must constantly adapt to reality, instead of trying to construct reality out of old, mistaken precepts. In both cases, intelligent beings resort to tribal identities and loyalties rather than to reading the facts, and the results are disastrous for a planet already in dire straits. Dawn of the Planet of the Apes also reveals what happens when toxic tribalism meets gun-ownership...and the results aren’t pretty. At the risk of wading into controversy, it’s difficult to deny the fact that the carnage in this film would have been much less significant without all the fire-arms. In this case, guns only make a tense situation that much more horrible and bloody. Guns don’t really protect anybody in the film, or make a single outcome more positive. Contrarily, they render every confrontation more dangerous by a multiplicative factor. When both sides are acting irrationally and with extreme violence, how, precisely, do you discern who the "good guy with a gun" happens to be? What you're really doing in a situation like this is basing your judgment on a biased pre-conceived notion, choosing the side of someone who happens to dress or otherwise look like you do. And that too is a resort to tribalism instead of rationality and reason. 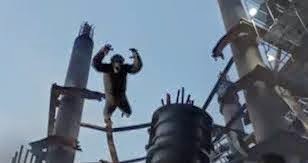 On another subject entirely, with Rise of the Planet of the Apes I worried some about the plot device of Simian Flu wiping out humanity, instead of humanity wiping out himself in a nuclear war, as was the case in the original 1968 film. How could apes hate man so much after 2000 years unless man had acted in such a rash, horrible, planet-destroying way? To my delight, Dawn provides the answer. It suggests that even in an end-of-the-world scenario, apes and man can’t put down their tribalism long enough to talk, to logically reason out a lasting peace for both. Generations may pass, but hatred lives on. Since we are long out of the Cold War at this juncture in our history, and the kind of irrational tribalism featured in the film is getting scary and murderous in real life right now, I appreciate the re-boot saga’s focus on that problem. In 2014, we can readily extrapolate a post-apocalyptic future whereinn tribalism is all that's left of civilization. Separate tribes, huddled in fear, lashing out at anything different or new, the person with the biggest cache of guns dictating what is defined as strength, and what is seen as weakness. Finally, I must note that Dawn of the Planet of the Apes is beautifully-shot, but I was especially impressed by the moments in the last act, wherein the titular orange dawn arrives at last. Caesar braces for a war he doesn’t want against people he doesn’t hate, with soldiers he doesn't want to see die. Malcolm, behind him, seems to recede into shadow...until he disappears into blackness. This is the Dawn of the Planet of the Apes indeed, but visually, it is also the Total Eclipse of Mankind. Malcolm -- the good man -- disappears into shadow, darkness, and history as a new force, a new tribe rises. What happens when a leader less wise than Caesar takes the reigns of ape culture? What will that "new" tribe be like then? I suspect we will learn the answer to such questions in future Ape movies, and I very much like the notion that this version of the story exists in the same universe as the first five films. This tale could be interpreted as the rise of the apes before the time travel interference of Milo, Zira and Cornelius, and their son, who “becomes” Caesar in that time line. This is how the ape revolution began the first time, and Rise and Dawn depict the events that led to the world Taylor found in the original 1968 film. His ship then returned to the present (in Escape) and altered that history, changing everything. What we are seeing, then, in Rise and Dawn plays like “unaltered” ape history, a chronology in which man causes his own downfall (through irresponsible science first, and then tribalism), and apes rise. Perhaps, even at some point, desperate humans will launch nukes in a last-ditch effort to prove their "strength" in the face of an ape culture on the rise, thus creating the Forbidden Zone. Who knows? A clever writer can square the circle in any number of ways and get us right back to Chuck Heston paddling for shore on that picturesque dead lake. But in the final analysis, it doesn’t really matter, I suppose, how Dawn of the Planet of the Apes fits in with a fifty-year old continuity. What matters instead is that this film speaks powerfully to us in the here and now as cogently as the 1968 original did to audiences of its day. Back then, we thought we would blow each other up in a nuclear war. Today, our contentious tribalism is the danger looming on on the horizon, threatening to tear down what so many have worked so long and hard to build and protect. And if that happens, says Dawn of the Planet of the Apes, our own worst human instincts will have made monkeys out of all of us.